It’s a glimpse but a telling one. Just over nine minutes into the below film of the 1965 French Grand Prix is footage of the top guns – bar an off-form Graham Hill – tackling a fast downhill left. 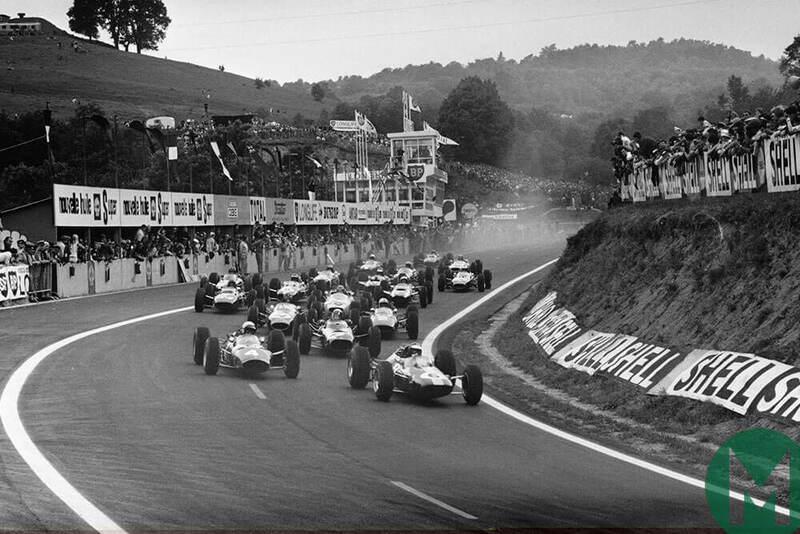 Of them Jim Clark is clearly fastest and clearly doing it his way. The Lotus is 2-3ft inside the painted white line as Clark turns – it’s more of a sweep really – into the corner. Jackie Stewart’s BRM P261 grazes that line; so does John Surtees’ V8 Ferrari; Dan Gurney’s Brabham BT11 crosses it; and Lorenzo Bandini’s flat-12 Ferrari straddles it. Clark turns in much earlier and more sympathetically – Gurney’s stance is particularly aggressive – and sits across the road’s dotted centre line at a point where Stewart – grappling with more understeer than he would have liked – is still entirely to the right of it. Beyond lies the only straight of note at Clermont-Ferrand – with 48 corners in its five sinuous miles – and Clark disappears from view carrying crucial extra speed. He had hinted at his advantage in At the Wheel, published in 1964: “Most people run deep into a corner before turning the wheel. “In this way you can complete your braking in a straight line, as everyone recommends you do, before setting the car up for the corner. “But I prefer to cut into the corner early and even with my brakes still on to set up the car earlier. His was an evolution of the trail-braking that Stirling Moss used – also in a Lotus – during the latter stages of his career: an alliance of lessons learned and natural gifts for a new breed of GP car. Moss – as the greats tend to be – was mystified as to why rivals did not attempt the same. Clark was the first to do so – and took it to the next level: “The most important thing you can learn in racing: how to brake. “It is considered that leaving your braking to the very last minute is important and I would agreed. But I would also say that where you take the brakes off again also matters. “If I want to go through a given corner quicker I don’t necessarily put the brakes on any later than usual. But I might not put them on very hard and take them off earlier. It would appear that Clark – as was Alain Prost in the 1980s – was able to cope with an understeering set-up that flummoxed most others who tried it. This made him easier on brakes, engine and tyres – as well as making him the man to beat at Indianapolis. Compatriot, friend and rival Stewart – Robin to Clark’s Batman – had every reason therefore to copy this ability, this knack, this art, of doing just enough. Stewart gained an insight into Clark’s MO when he replaced him at Kyalami’s non-championship Rand GP in December 1964. Stewart qualified a brand new Lotus 33, chassis R10, on pole for his category debut and won the second 25-lap heat from the back after a driveshaft had broken at the start of the first. “And it wasn’t that difficult if you know what I mean,” he says. “That was concerning. I’d been testing the BRM a lot [he’d already signed for the Bourne-based team] at Snetterton. Having to balance its understeer against oversteer. “The Lotus, you almost had to avoid overdriving it. “Its grip and adhesion were unbelievable. It felt as though its centre of gravity was six inches below ground [rather than at track level]. Thus Clark was extracting the most from the best equipment. And he was absolutely at the top of his game in 1965 having led every lap from pole – and setting fastest lap – at the South African and Dutch GPs and leading all bar 10 laps of the Indy 500. His French GP was not without troubles, on and off the track. Chapman, delayed by a chance meeting with Yuri Gagarin at the airport, crashed their hire car into a ditch en route. And then Clark’s practice at a circuit new to him was limited severely by suspension failure and problems with the 32-valve Coventry Climax V8. Apparently and understandably feeling ‘niggly’, he hopped into the spare – R6, an updated 1963 car fitted with an old-spec 16-valver – and grabbed pole from Stewart by five-tenths. Surprising rivals by electing to start from the left-hand side of the grid – being happy to take a tight line into that fast downhill left – he again led throughout. Stewart gave spirited chase but Clark was always out of sight, away around the next bend. “I didn’t know very much then and was driving by the seat of my pants,” admits Stewart. “By the end of my career there were in my mind eight elements to every corner. In 1965 there were three: entry, apex and exit. “And braking was a one-element experience. Well, it’s not. “I was driving through subtleties and unbalancing the car as a result. “I didn’t know enough about set-up. I had to rely on [chief engineer] Tony Rudd to try to make my car less reactionary. But he was devoted to Graham [Hill]. “Everybody loved Graham – he’d earned it and deserved it – but he was tough to work with and very insistent: the front end of his car was amazingly stiff. Cruel fate – as it had with Moss and Clark – had denied us a great duel. Edited by Royale, 30 March 2018 - 03:18 AM. How long a trip is that? It is just over 100 miles, so about 2 hours 20 mins by road according to Google Maps. There might also be the option to go and stay with my in-laws, in which case it is only 40 miles or just over an hour from their house. Even if I don't go to Duns, then I probably will still go to visit the statue of Clark in Kilmany next weekend, which is only about 6 miles from where I live. I also see that Motorsport magazine have a load more Clark articles this morning too. Edited by Border Reiver, 03 April 2018 - 02:14 AM. Here are a few photos from our trip yesterday. We went to Duns, Chirnside, Charterhall and then Kilmany on the way home. Edited by Border Reiver, 08 April 2018 - 06:35 AM. For some reason I get a (Sorry, you don't have permission for that!) message when I try to view the pictures. Thank you very much, Rob. Super photos.